When we last spoke with charismatic and eternal Teen Beat poster boy Davy Jones last year, we admittedly were left wanting more, namely another batch of shows featuring the original Monkees. Selfish, certainly, as the boys have been electrifying the world since 1966. Safe to say they have earned their gold watch and a leisurely retirement. Luckily, a Monkee never tires. Florida’s golf courses will have to wait. On the heels of their 45th anniversary, the Golden State band with the extroverted Brit front man are once again kicking tires and lighting fires, embarking on an international tour. After five decades in the business, their fanatics, which are an eclectic demographic that ranges from 8 to 80, are prepping themselves for another dose of pandemonium that only the Monkees can inspire. The only act to rack up four #1 albums in a year (let that statistic settle. It’s mind numbing and untouchable), the Monkees take the title of “Living Legends” to another tier; allow us to coin the term “Performing Legends”, complete with a photo of the fellas next to it in the encyclopedia. We could think of no better way to celebrate their impending and triumphant return then once again dishing with Ee regular and one of our favorite guests, the enigmatic Davy Jones. So Mr. Jones ... after a great deal of speculation, I guess it's true. The Evening with the Monkees tour is now in high gear. How are you feeling about all of this? Are you excited? How did this come together ? We were approached by a major respected management company ... Frontline ... and we felt it was the right time. This is no small undertaking at last count there are 34 U.S. and 10 U.K. dates booked, at major venues I should add. Sounds like a tremendous amount of work and planning, and 43 years after Valleri topped the charts. I trust rehearsals are under way? You've never stopped touring as a solo artist but this is different . How does if feel to be reunited with your mates? Together we have a chemistry that explodes on stage. Great songs. Happy memories, and fun times. Fans have always loved the live shows. Without giving anything away ... has technology changed The Monkees live production? Well yes .... we hope to use film on a number of songs. It will add a bit of nostalgia to the evening. 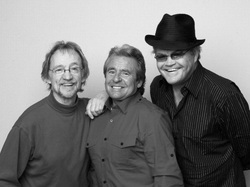 Do you anticipate The Monkees trademark high-energy shows ... and is hysteria welcome? We hope to see lots of smiling faces singing along to the many hits they will be hearing. Any thoughts on recording these live performances for DVD or CD release? There are no plans initially but we are always open to ideas. This is a great opportunity fans to have a wonderful evening . The tour launches from your homeland, the UK, mid-May. In June the show lands here in Cincinnati. Time permitting, an Executive Edits dinner would be fun. Thanks ... we will keep in touch before the tour.